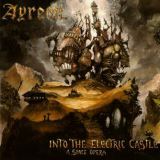 Despite being only the third Ayreon album out of eight, Into The Electric Castle has always held a special place in my heart, probably because it was the first one that I heard, and the album that introduced me to Arjen Lucassen’s fabulously over-the-top prog world. Some Prog Metal bands are about the collective skills of the members, and about showing them off in as tuneful a way as possible – all power to Dream Theater’s elbow, but sometimes you want to have a bit of fun with your prog. And fun is what Ayreon have always provided me, with the bonkers sci-fi settings, the myriad of guest vocalists, and the catchy, masterful songwriting that picks you up and carries you away to Arjen’s world. This is one of the rare double-albums that I never have any hesitation about putting on, despite the lengthy running time, simply because of how captivating and enjoyable it is. Take the first track proper, the eleven-minute Isis And Osiris, taken up with a sung discussion between the various characters (played by Anneke van Giersbergen, Sharon del Andel, Damian Wilson, Fish and others) about their situation, built on the strengths of the vocalists and backed up with some very impressive instrumental work from Arjen and drummer Ed Warby (also of Hail Of Bullets!). Everything from synth solos to Anneke’s glorious wailing is built in perfectly, and despite the length and ridiculousness of it all, it’s instantly loveable. The album is, of course, far too long for me to describe each nook and cranny, but even Arjen’s detractors would have to admit that the man knows what he’s doing. His performance as the hippy, not least in Amazing Flight with the infamous ‘hey dude’ section may annoy some, but it’s always made me laugh, and the fantastic ensuing guitar playing should be more than enough to silence the haters. Time Beyond Time proves Arjen’s songwriting ability is superb, whether it’s in writing vocal hooks, guitar hooks or flute hooks. Each new track has a new melody to engage with, to enthral in, from the 70s pop jingle of Tunnel Of Light to the glam rock stomp of Across The Rainbow Bridge, the latter incorporating some heavy metal crunch that gets more common as the album continues. The only moment that really seems out of place to me are the snarled vocals on the otherwise excellent Cosmic Fusion, jarring alongside the clean vocals used everywhere else. Otherwise, Into The Electric Castle is an excellent piece of prog, an album that envelopes you wholly in its escapist world, and like most Ayreon, succeeds at not only fulfilling the genre’s innate expert grasp of its instrumentation, but also at making it enjoyable in the process.